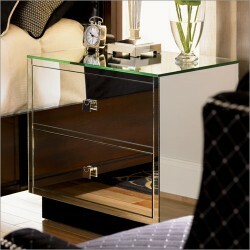 With mirrored bedroom furniture, you are bringing in an element of energy and brightness to your bedroom as well. The bedroom is one of those tricky places to decorate. You walk the line between wanting a style that is both comforting and also a place where passion can live. Depending on your situation and desires, you may try to mingle both of these qualities together into one great design. There are several factors that go into this, including color, fabrics, wall decor, bedding choices and furniture. With mirrored bedroom furniture, you are bringing in an element of energy and brightness to your bedroom as well. There are those in Asian design and decorating who believe that mirrors and moving objects bring chi or energy into a space. If you combine this idea with other color choices, you can certainly find more passion and energy in the bedroom. Likewise, you may wish to bring a soothing element to your bedroom space as well. In this regard, you may find that color choices make a much greater impact on your moods and emotions. A color palette rich in the Earth-based colors, like browns, sages, blues and purples can help enforce these feelings. You can also use design elements that bring in wood or similar textures from the outdoors. One key point to remember is that a cluttered space will not feel calm. One way to address clutter in your bedroom is by using objects and other furniture pieces outside that space to assist you. In other words, by having an area or furniture item that can catch all your loose objects before entering the bedroom, you will naturally limit the amount of clutter that accumulates there. Consider how using a narrow console table at your entrance way or in a hall leading to your bedroom could serve this purpose beautifully. It, too, could actually be a piece of mirrored furniture. The whole point is to understand how your colors and pieces reflect and represent the type of energy you are wishing to create.